This map demonstrates territory of Russia. city Zlatoust marked. On this map city Satka for Garmin. You can find here town Berdyaush download for free. On this map town Leninsk presented. Displayed town Syrostan for Garmin. You can find here Karimovo for Garmin. Zyuratkul' free download. Displayed Zhukatau for Garmin. On this map Yurak marked. Vozrozhdeniye download for free. Os'mushka marked. You can find here Veselovka presented. Verkhniy Atlyan presented. On this map Verkhniy Iremel' for Garmin. You can find here Verkhneaysk marked. Ustinovo free download. 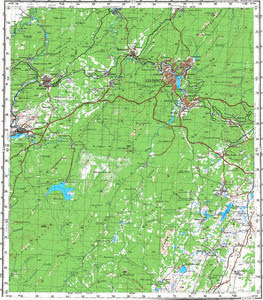 On this map Ural-Dacha marked.